One of the unfortunate truths about being responsible for a dog is that you are responsible for that dog’s poop as well. However, one of the things that make that job easier is the dog poop bag. In this buying guide, we will be looking at some of the top dog poop bags on the market as well as exploring the features in types of dog poop bag so that you can make the best decision possible when it comes to buying yours. For such a simple item there are quite a few things to consider when buying one, but with this guide you should have a major advantage that will allow you to get all the features that you need and the best poop bag for you and your pooch. These are some of the top five dog poop bags that are currently on the market, with extremely good design and construction along with the features that you need to clean up after your dog with ease. Any of the choices below will be perfect for your daily walk or a trip to the park, and these bags definitely represent the best of what is currently available. These Earth-Rated dog poop bags are some of the best out there, coming in both the unscented and lavender-scented varieties. This comes with 270 individual bags that are divided up into 18 refill rolls that have 15 bags each. These bags measure 9×13 inches and you can get a separate leash dispenser from Earth-Rated that these bags will fit in. This gives you a four month supply of bags that you are really going to like and that are going to last you for a very long time. But these bags have some terrific features that you will love as well. These high-quality poop bags are bigger, thicker and tougher than most of the other poop bags that are on the market. They are going to hold up well to having dog waste in them and not leak. They are easy to use and close up to prevent odor from escaping, and they are a snap to detach from the roll. You simply pick the poop up with the bag on your hand and then turn it inside out so that you never get anywhere near the dog mess. This is a terrific system that works really well and with accessories like a lease dispenser, you always have bags with you when your dog decides to go. From AmazonBasics, these dog waste bags are really terrific and you have so many choices when it comes to customizing your order that you are certain to get the perfect dog poop bag. The first choice you have to make is whether you want to go with enhancer standard dog poop bags. The enhancements cost a little more, but they also are reinforced and a little stronger. You also get to choose how many poop bags you need from 270 all the way up to 900. Obviously, the more you get at once the more money you save. With this particular product, you get a dispenser that will clip onto your belt chain, attached to your leash or if you take your dog out in a stroller then you may want to attach it there instead. In either case, it is extremely convenient to have a dispenser that these bags fit in, but it is not the only good thing about this product. These polyethylene bags protect hands and minimize odors using a carabiner-style clip. Each bag has a dimension of 9 by 13 and it comes with a one-year warranty from Amazon. This product is probably one of the best buying decisions you can make when it comes to dog poop bags because you are able to get exactly what you want backed up with a terrific warranty and at an amazing price. Gorilla Supply provides the next poop bags that we will be looking at. This is a good brand and this is a good bag to use. One of the things that anyone concerned about the environment will like is that these bags are coreless so that there is no waste. But what really makes this set of poop bags unique is that there are 1000 of them and they all fit into the patented dispenser that goes with it. These blue bags are extremely strong and BPA free. They are made of strong EPI plastic, easy to use and completely leak proof. 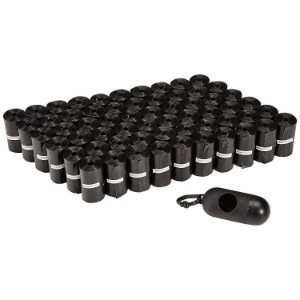 When it comes to poop bags, sometimes you just want a whole bunch of bags for a very low price that are going to work. This is the perfect solution because not only do you get a thousand bags that are sure to last you for at least a year and perhaps several years down the road, but you also get a dispenser that you can attach to your belt, to your leash or to a dog stroller or carrier so that you always have them on hand. These dog poop bags are not necessarily the strongest or the ones with the most features, but they certainly will get the job done and they come in bulk for a pretty amazing price. There are lots of great poop bags on the market, but these Pets N Bags dog waste bags are earth-friendly and get the job done. There are a lot of choices when it comes to dog poop bags, so what’s so special about these bags? First, they are extremely tough. Also, not only are they odorless, they also trap odor inside of them when the bag is closed so that it never escapes. Plus, there are very easy to dispense, and you can grab one with a single hand while you are holding your dog’s leash and have it set up and ready to pick up the poop in seconds. These bags even come with their own dispenser so that you always have a fresh supply of poop bags within reach. These allergy-free bags are completely odorless, with a dispenser that lasts for a very long time. Both the dispenser and the roll of bags Is completely compact and you get a total of 360 bags that are divided up into 24 different rolls. This means that you have plenty of bags for months to come and you will be able to pick up your dog’s poop easily and quickly, without ever having to worry about mess, and get back to enjoying playtime with your dog. These bags truly shine as an example of one of the best poop bags currently on the market. 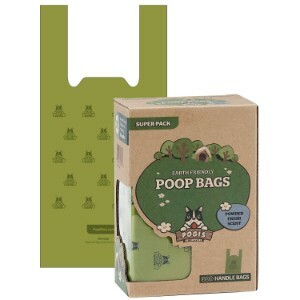 These poop bags from Pogi are also a terrific choice for your next dog poop bag. If you have a dog, then you know that being a responsible pet parent requires that you clean up after your dog. That means that when you take them for a walk or let them play in the park that you are responsible for cleaning up their poop. Luckily, these poop bags make that job much easier. You get to choose from two different quantity bundles as well. You can either choose to buy 300 bags which will last you for a few months or you can get the 900 bag bundle which will probably last you for at least a couple of years. The way these bags work is simply by coming off of the roll and easily opening so you can stick your hand inside the bag, pick up the poop, and then reverse the bag in seconds tying it up to prevent leakage and odors by tying the two handles together. These bags are extremely tough and measure seven by 14 ½ inches. They will pick up your dog’s poop no matter what breed you have or what size your dog is, and you get plenty of them at a very low price. These extra-large bags may not be for everyone, but for dog owners who have trouble with standard size pet poop bags, these are an amazing option. When it comes to buying a dog poop bag, there definitely some things you want to keep in mind. You have to think about things like whether you are using a pooper scooper and whether your dog poop bag is compatible. You also have to consider where you are going to be storing the poop bags when you take your dog for a walk. For example, if you are using a dog stroller, dog bike trailers or a dog seatbelt and dog car seat cover, then you have plenty of places to store your poop bag. However, what if you are just taking your dog out for a walk? Then you are going to need some sort of dispenser or a pocket that you can store the bags in. In this buying guide, we will be looking at all of the various factors involved in buying a poop bag. Just like with other things that you purchase for your dog that are a necessity like a dog bowl or automatic dog feeder, a dog bed, dog house and dog food container, your poop bag should be as high quality as possible and offer all of the features that you need for that product. You want to take your time and find the perfect poop bags because they usually are sold in bulk and so you will be using them for a long time. That means that you want to get the right ones the first time. There are several reasons that you might need a poop bag for your dog. The first is so that you can keep your yard clean. Even if you have an electronic dog door or an outdoor dog kennel or dog playpen, you still want the ground to be free of dog poop when you go out. 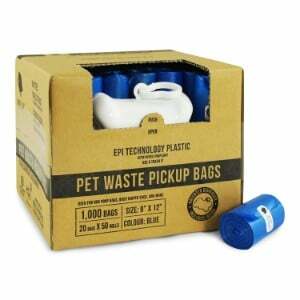 But just like using a dog crate to drive your dog around or a dog gate to keep them from entering rooms where they could get hurt, you need poop bags because you are a responsible pet owner. But what you may not know is that you probably need a dog poop bag when you take your dog for a walk because in most cities and towns, there are ordinances requiring you to clean up after your dog. There are several types of poop bags that are out there on the market. We will be taking a look at each of them in detail here so that you can see what type of poop bag you want to get for your dog. Biodegradable: Biodegradable poop bags are the first type poop bags that will be discussing. Biodegradable bags actually decompose completely within a few months. They are usually made of plant matter which is why there able to break down so easily. Do not confuse biodegradable bags with degradable bags however, because degradable bags often require heat to break down and they only break down to smaller parts not completely. Flushable: You may also want flushable bags for your yard. Flushable bags allow you to flush them in any standard toilet, and while this may not be necessary for going out into the park or taking your dog for a walk, it can be extremely useful to be able to flush or dog poop down the toilet when you are cleaning up the backyard at home instead of throwing it into a trashcan where it can start to smell. 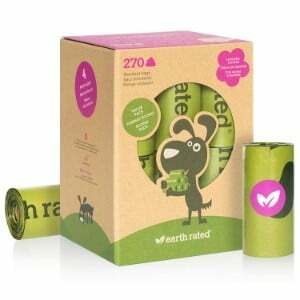 Compostable: Compostable pet poop bags are specially made bags that break down so that they can be thrown in with organic waste matter. These types of bags are designed specifically for compost pits, and although they are more expensive than other types of bags, this can be an extremely convenient way to fertilize the ground. Paper: Paper bags are also pretty good and inexpensive, but you have to keep in mind that paper bags have a tendency to tear and may not be able to hold your dog poop as successfully as other types of bags. However, they are one of the least expensive types of bags out there. Pooper-Scooper: The bags that come with your pooper scooper may need to be in a class by themselves, because with some pooper scoopers the only bags that you can get for that model are those specific bags. It is unlikely that you will be able to use another manufacturer’s poop bags with that pooper scooper, although many of them are universal and simply recommend that you stick with the manufacturers bags. Household Bags: There is also the household grocery bag, Ziploc bags that you keep in your kitchen or various other bags around the house. This is a temporary replacement for the pooper scooper bag, but grocery bags and the like do not do nearly as good a job as an actual poop bag. When it comes to features, there are several different ones to choose from. Let’s take a look at some of the features that dog poop bags provide so that you can see what is going to be most important to you. This will allow you to choose your dog poop bags based upon those features and how they perform. The capacity is an important consideration for some people. Some people have large dogs and have to pick up a lot of poop, but this isn’t always easy because standard size bags are made for small and medium dogs. Ensuring that your bag will not leak is something else that you need to do in you are looking at dog poop bags. You want think bags that are forced to make sure that there is no leakage and you want them to be able to close up tightly. 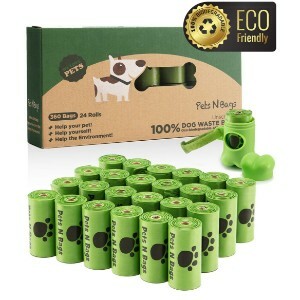 Ease of use is also something that you need from dog poop bags. Whether you’re using them by hand or using them in conjunction with the pooper scooper, you want to be able to scoop up the poop quickly with no mess and no problem. The bottom line is that there are lots of different things to consider when it comes to buying the right poop bags. As a responsible pet owner, you want to have good bags that you can clean up your dog’s mess with whenever you take him or her to the park even if you have a doggy door and they go out into the backyard to do their business. Having pooper bags on hand is the best way to make cleanup easy.